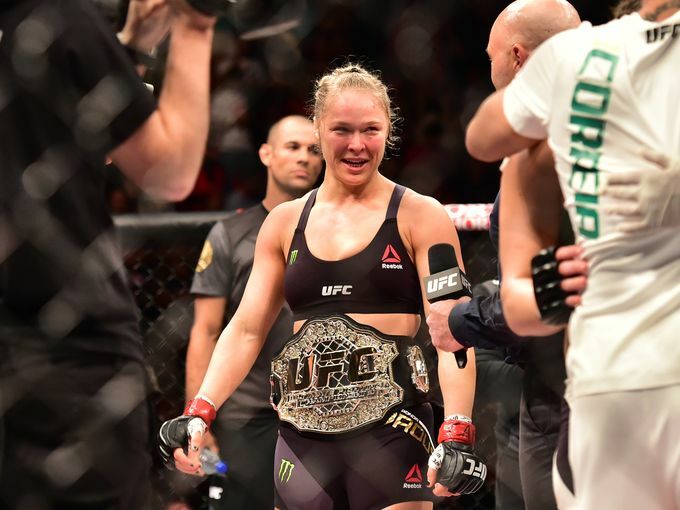 Has Anyone Dominated a Sport Like Ronda Rousey? I have to admit I was expecting a better fight at UFC 190 in Rio de Janeiro between champion Ronda Rousey and her Brasilian challenger, Bethe Correia. The challenger showed no fear of Rousey in their pre-fight meeting as she was 9-0 and confident she could take the UFC champion. The match lasted 34 seconds in Rousey’s sixth title defense as she increased her record to 12-0. Rousey came out aggressive attacking Correia who withstood the first three blows before succumbing to a right hook. Correia definitely was not thinking straight in the pre-fight banter as she made a tasteless comment to Brazilian media in which she said for Rousey to “please don’t kill yourself; don’t commit suicide.” This was personal for Rousey as her father took his own life. Rousey is a beast in the octagon who many people would never consider fighting her. The last thing anyone should be doing is adding more fuel to Rousey’s motivation by getting personal. Now it looks like Miesha Tate will take on Rousey a third time in December 2015 at AT & T Stadium in Dallas, Texas. Rousey has won the first two fights via her signature armbar although Tate is the only opponent who has gone beyond the first round losing in the third round. Both fighters were sloppy in the fight that lasted until the third round. Rousey is a much better fighter now than the last time she fought Tate. Look for Rousey to continue pummeling her opponents as fans look forward to her fights like boxing fans used to salivate looking forward to the next fight for Iron Mike Tyson. Will she eventually start wrestling men to be challenged? If you haven’t heard of Ronda Rousey by now, it’s time to listen up.